Below are signed photos of Roy Rogers for sale. The signatures on the photos range from the authentic (signed by hand, by Roy Rogers), to secretarial (Roy’s name signed by another person with his knowledge and consent), to (possibly) other types of signatures. Is It Really Roy’s Signature On Those Photographs? 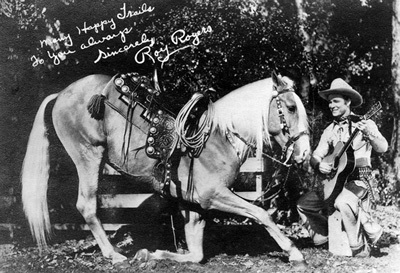 Here at RoyRogersWorld.com we are not experts on recognizing Roy Rogers’s authentic signature. We encourage you to investigate the authenticity of the signature on any item you might be interested in for yourself. 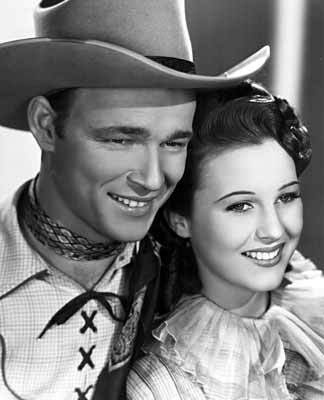 Below are a few photos of Roy Rogers. This is a 1960 photo of Roy Rogers being held at gunpoint by a chimpanzee. The photo is from “The Chevy Show” which ran on the NBC network from 1956 to 1963. The show was hosted by entertainer Dinah Shore. 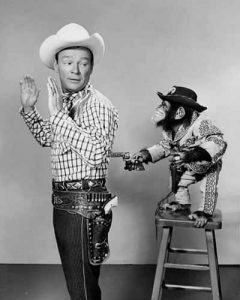 Photo of Roy Rogers being held at gunpoint by a Chimpanzee.